An artist's conception shows a deep-space transfer vehicle flying near a exploration gateway platform at right. A concept that calls for building a deep-space outpost beyond the moon's orbit has stirred up some positive buzz from space pioneers — including Apollo 11 moonwalker Buzz Aldrin. Over the weekend, the Orlando Sentinel reported that top NASA officials have chosen the construction of a space exploration platform at a gravitational balance point known as EML-2, or Earth-moon Lagrange point 2, as the agency's next major mission. The outpost would be held in an orbit 277,000 miles away from Earth, and 38,000 miles beyond the moon. The concept has been under study for months, and the Sentinel reported that NASA Administrator Charles Bolden briefed the White House on the preferred plan's details this month. There's been no information from NASA or the White House on the time frame for deciding whether to move ahead with the concept. Right now, NASA has been focusing on development of the Orion deep-space capsule and the heavy-lift Space Launch System, or SLS. NASA sees Orion and SLS as critical elements for the deep-space construction project. The first unmanned test of the Orion-SLS combination is currently set for 2017. A later test flight, now scheduled for 2021, would send astronauts on a path looping around the moon and returning to Earth without stopping. Getting the EML-2 station ready for human habitation would presumably take longer. For now, NASA and its partners have committed themselves to supporting operations on the International Space Station through at least 2020. President Barack Obama has set a longer-range goal of sending astronauts to a near-Earth asteroid in the mid-2020s, and to Mars and its moons in the mid-2030s. The outpost at EML-2 has been cast as an "exploration gateway platform" — a potential stopping point on the way to those farther-out destinations, as well as a potential staging area for lunar missions. 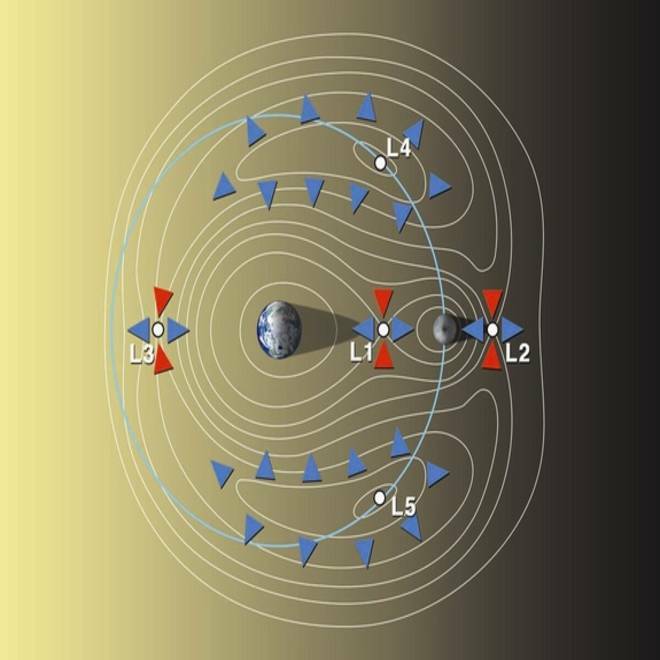 The Lagrange points for the Earth-moon system are the places where the gravitational pull exerted by the two celestial bodies come close to balancing out. NASA reportedly favors a plan to put an outpost at the Earth-moon L2 point. Astronauts parked there could teleoperate robots on the lunar far side. Aldrin noted that he and Apollo 11 commander Neil Armstrong made the first moon landing in 1969, which was 66 years after the Wright brothers' first heavier-than-air flight in 1903. He thought it was technologically doable to plan for a Mars landing 66 years after the moon landing, which would be in 2035. But is it politically doable? "There's one thing that doesn't exist: leadership. ... We need a presidential decision," Aldrin said. His suggestion? Lay the groundwork for exploration beyond Earth orbit, and get ready for a future president to make a JFK-style "We Choose to Go to Mars" announcement on July 20, 2019 — the 50th anniversary of the moon landing. "Humanity is destined to explore, settle and expand into the universe," Aldrin said during a panel discussion on Sunday, "but doing so urgently requires a rekindling of America's space program." Other astronauts issued similar calls for step-by-step exploration: Skylab astronaut Owen Garriott, for example, said "there is a lot of work that needs to be within the orbits of the earth and the moon" before astronauts can be sent to near-Earth asteroids or farther-out destinations. Later, he told me that "I agree with Buzz" on the idea of creating outer-space steppingstones to Mars. Jim Lovell, who went around the moon during the Apollo 8 and Apollo 13 missions, recalled that he and Apollo 11's Armstrong were in training for their spaceflights when President John F. Kennedy was killed in 1963, ending a White House era that came to be known as Camelot. Armstrong's death last month could be seen as a similar ending of an era, Lovell said. "The passing of Neil Armstrong closed the book on the Camelot of manned spaceflight," he told the Seattle audience. "Now we have to write a new chapter." In this age of tighter budgets, how much will the spaceflight saga's new authors be able to write? The scenario for the beyond-the-moon outpost calls for using spare parts that were built for the International Space Station, as well as hardware provided by Russia and Italy. But even with those money-saving measures, the plan would still call for "modest increases" in NASA's budget — which runs counter to the current expectation that NASA will have to cope with lower funding levels going forward. There are also technical questions to resolve: For example, how will astronauts cope with the higher radiation levels in deep space? NASA has been studying various schemes for radiation shielding, but none of those concepts is currently ready for prime time. Then there's the continuing debate over whether the Orion-SLS system will turn out to be affordable in the long run. Current estimates put the cost of development at roughly $18 billion through 2017, and as much as $35 billion by the time the test program is complete. Charles Lurio, an independent space policy consultant who has long been critical of the SLS program, said it would make more sense to build the deep-space outpost using commercial launch vehicles. What do you think of the idea of building an outpost beyond the moon? How would you balance space ambitions and budget realities? Feel free to weigh in with your comments below.